History teaches that wars are inevitable. They are genetically ingrained into the human mind – as well as the rest of the Animal Kingdom. The use of violence and belligerence to get what one wants, starts as early as childhood among siblings, later on in the school yard and then progresses to become more innovative, nasty and evil right into ripe old age. Selfish “Want” is the source of all belligerence and, hence, wars. Probably because of their slightly more advanced cognizant abilities, humans have always tried to curb their inherent belligerence, especially as they evolved from Hunter-Gatherers to a primitive sedentary state and thence to early villages, city states and eventually to kingdoms and empires. They tested and applied various forms of kin/clan relationship rules, religious constraints and guidelines, and lastly state laws that were designed by kings or, thereafter, the elites. But none of these attempts worked, and wars continued unfettered. In fact, they became more vicious, bloody and devastating as new inventions were diverted to military use; bronze weapons, chariots, catapults, Greek-fire, longbows, gunpowder, aircrafts, nuclear energy, lasers, space travel, etc. Humans tried to control wars by treaties, alliances and truces, but they were all fake and, hence, short term in nature. They were never worth the paper they were written on – or the handshake that sealed them. History contains many more abrogated or reneged-on treaties than what we have seen in the past couple of years – or are likely to see in the near future. The issue is not treaties, which are basically a camouflage to hide the present unreadiness or incapability of a potential aggressor to grab what he wants and, hence, both signatories use them to buy time. The problem is the unbridled “Want” – the lusting over others’ assets, be they land, natural resources, markets, know-how, political control, etc. In short, the desire for regional or global hegemony and control is irresistible, but always ends, and badly at that! The problem becomes much bigger when “Want” and selfish desires are manifested by the mighty and powerful, for they cannot be reined in. The mighty are able to ignore with impunity international laws and norms, international institutions or tribunals and can unilaterally decide justifications for their aggression on those weaker than them. This aggression can take various forms such as destructive kinetic wars, sanctions, embargoes, interference in others’ internal affairs, choking of economies, instigating civil unrest and civil wars – All to satisfy their insatiable “Want”, which is then sloppily disguised intellectually as geopolitical strategies and national security needs. George Friedman, of Geopolitical Futures (ex-Stratfor), wrote on October 22, 2018 that nuclear treaties are of little value because the real deterrent to nuclear war is the fear of the human devastation it would bring upon the warring parties themselves and, incidentally, the whole world. If this argument is a prelude to justify the US administration’s intent to withdraw from the 1987 Intermediate-Range Nuclear Forces Treaty (INF) between the USA and the USSR (Russia), then it needs reexamination as it seems skewed towards a predetermined conclusion; mainly that there is no harm in abrogating the INF treaty and the world should not react negatively towards the US for increasing the risk of human destruction. However, its logic may also be used to vindicate the desire of many countries to own nuclear weapons, which contradicts and undermines the decades-old hysterically rigid policy of non-proliferation (which has caused at least two wars; Libya and Iraq and is now threatening Iran and North Korea). The likely answer to such a demand may be premised on the haughty assumption that all the non-nuclear countries of the world are run by unreliable people, who cannot be trusted to understand the risks and outcomes of using A-bombs (Hiroshima & Nagasaki?). A double-edged example is cited by the article about “crazy” Mao Zedong (the great Chinese leader) threatening the world with annihilation up and until he got his own nukes, whence he immediately ceased all threats. 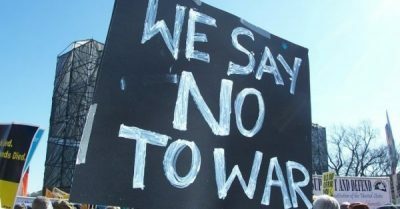 While we agree that treaties do not prevent wars – but only delay them – we do think that treaties which limit the development of evermore sophisticated weapons and restrict their geographic deployment can rein-in the ever-growing destructive power of new weapons entering the arena. At the least, such treaties may buy the sourly needed time till the issue of selfish “Want” is addressed in world international relations, if it ever is. However, a more salient aspect to treaties is economics (Not addressed by the strategist). All wars are expensive and, at the end of the line, when an aggressor runs out of new territory or victims to usurp, he usually collapses from the sheer weight of costs. History is full of examples of the dire end of bankrupt mighty empires. Presently, the world economy is drowning in record debt and no country is immune to budgetary runaway expenses and deficits, let alone to contemplate embarking on a new expensive arms-race. And for what end? The mighty already have enough nuclear bombs to destroy the world many times over, adding more is not likely to dramatically tip the scale in any party’s favor, at least in the medium to longer term. It would certainly be bonanza for the weapons manufacturers and suppliers, but the truth of the matter is that they would be a lot better off diverting their military expenditures towards their social and economic development. The real problem boils down to the issue of the selfish “Want”. While it cannot be erased from the human psyche, it can be controlled and mitigated by collective counter action. Just as a solitary single Buffalo or Gnu can easily succumb to a lion, their joint effort to stand their ground and retaliate usually results in the death or injury of the lion and calling off the attack. Does humanity have the intelligence and wherewithal to find a way to control geopolitical “Want” and lust? We may need to wipe the slate clean and invent an entirely new set of rules of interaction between nations. Otherwise, all will soon be lost, no matter who wins the battle.